My companion filled me in on her adventures in the medical facility as we rode, and that is her story to tell. She was feeling better, though resigned to maintaining a mostly liquid diet for the rest of the ride. 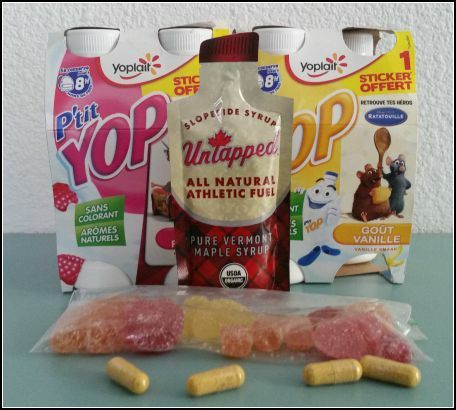 The French have a yogurt drink called “Yop”. It’s mildly sweet, loaded with probiotics, and since the French do not share the American obsession with avoidance of fat, an eight ounce serving has 350 calories. It is a near-perfect food for late in a ride, and both of us took full advantage after securing a 6-pack of it in one of the towns we passed through. We had a quick stop in Villaines-la-Juhel, grabbing omelets and a cup of vegetable broth from a street vendor. This time we found our drop bags without difficulty, and I changed my shorts in the square under cover of my rain jacket while a pair of older French couples watched and teased me in two languages. There had been no rain so far, and I lightened my load by leaving my rain gear and the food I’d not wanted in the drop bag. Dusk was falling as we pulled out of the control and back on the open road, 220 kilometers to go. As the night wore on, we stopped briefly for coffee at various tables set up by local villagers. Between my friend’s near-fluent French and my halting attempts, we communicated well and enjoyed our too quick stops. Eventually, food and conversation were not enough to keep me awake and I insisted on stopping for another nap in a ditch. She stood by and guarded the bikes, not needing the sleep like I did. Pedal, eat, repeat; the night wore on, this one warmer than the last two because of a blanket of clouds overhead. Outside of Dreux I found myself drifting off again, and stopped for yet another nap as it started to drizzle. About three kilometers before Dreux, the heavens opened and the drizzle became a real rain. I lamented leaving my rain gear in Villaines-la-Juhel, but there was nothing to be done except pedal onwards. We stopped at the control just long enough to check in, not wanting to make a real stop 100 kilometers from the end. The patisseries outside of Dreux looked inviting, but neither of us wanted to stop in the rain so we pressed on. For a while I struggled to keep my eyes open and my bike moving forward, but eventually my brain agreed to function and another maple syrup packet sealed the deal. We were in a sea of other riders, slogging through a wet tour of the French countryside. It was sobering to realize that every other rider on that road was as sleep deprived and fatigued as I was, all of us with the relative cognitive function of someone who had tipped back more than a few pints of 10% ABV beer. And some had – beer and wine were available at every control and while I had eschewed the temptation of a depressant beverage during a period of sleep deprivation, others had been more daring. The road twisted and turned, up and down rolling hills through a myriad of towns. It felt like it would never end. I nibbled on gummy candies, but couldn’t bring myself to eat more cookies, bars, or sports drink. With cold, wet hands it became harder to get stuff out of my bike bag, and with the wet pavement and squirrely riders I didn’t want to take either hand off the handlebars. 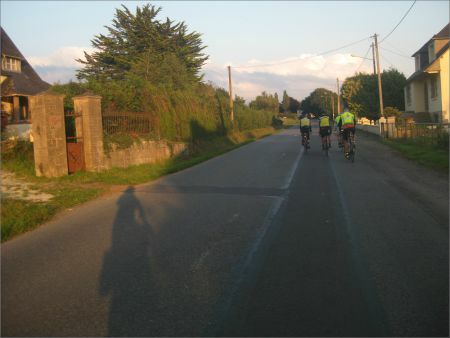 Despite being advertised as a 1200k ride, the course was actually 1230 kilometers long, the last 30 kilometers a meandering journey through all the small towns around St. Quentin-en-Yvelines. Annoyed with the rain, the cold, and the “extra” kilometers, I was on mission to just get ‘er done. I got into a pace line with a group of men whose language I didn’t speak, and fought hard to keep up. The kilometers rolled by, and finally the end was in sight. I was impatient and pulled ahead of the guys, racing the last few kilometers to the Velodrome and following the maze into the corral at the end. There was a crowd of people behind a barrier cheering on the finishers. I was aware of a blur of bodies, sounds of cheers and applause, the rain pounding on my helmet and running down my face. My bike went into a corral of other bikes and I joined the queue to the final stamping of my brevet card, the official end of the ride. 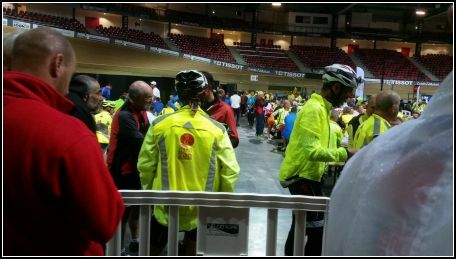 Inside the velodrome, I waited in a sea of other riders. I was completely bonked, feeling shaky and tearful as I stood at armpit level among strangers who happened to have finished at the same time as I had. I got my card stamped, took a photo, turned in my paperwork, and fled from the scene. Official time, 88 hours 19 minutes. There is a litany of people who helped to make completing this ride possible, who deserve mention and thanks. First and foremost to my friend and fellow rider, Michele: I had ruled out attempting PBP at the end of last year, convinced that I didn’t have the budget and that it was dumb to try an international 1200k without a domestic one under my belt. You convinced me it was not only possible, but SHOULD be done. You helped me figure out the “silent bonk”, discover the benefits of maple syrup, learn to manage sustained rollers in Wisconsin, travel with a bike, and navigate the French rail system. You also set up all the hotel arrangements and drop bags, and contributed your legendary panalettes for our snacking pleasure. Despite a truly formidable set of physical circumstances, you accomplished everything you wanted from this PBP. Randonneuring, like life, is more about the journey than the end point, and your ride was a living demonstration of this truth. I truly doubt I could have done it without you. To my friends Osvaldo and Hector, thank you for putting up with my slower pace through a year of local rides and brevets. You provided companionship on what would otherwise have been a lot of lonely training miles. To Tim Sullivan and Greg Olmstead of the San Diego Randonneurs, thank you for sharing your experiences with PBPs past and for all of the encouragement along the way this year. To Scott, Bob, Steve, Rebecca, and everyone else I met during PBP, you helped make the ride memorable, and I’m looking forward to running into you on another ride. Last but certainly not least, thank you and a thousand hugs to my husband, Shaun, for putting up with all the training, planning, purchasing, organizing, and general obsession I’ve had with this ride since the beginning of the year. I love you with all my heart and couldn’t do this stuff without your support!!! Sleep deprivation is a reality in endurance riding. Studies have shown that going just 18 hours without sleep alters performance and judgement in much the same way as having a blood alcohol content of .05%. After 24 hours without sleep, reaction time decreases by as much as 50%, hand-eye coordination drops, and performance in many tasks becomes worse than performance at a blood alcohol content of .10%. Cognitive function is equally affected. For example, medical residents, after working a 24 hour shift, may no longer remember the names and details of patients they saw at the beginning of their shifts. By the end of the first night of this event I (and probably every other rider on the road) was substantially impaired in the ability to make rational decisions and to operate a moving bicycle. We rode for FOUR nights. At the end of the ride, in my impatience to get out of the rain and finish, I got ahead of my friend and kept going. This was the first of many poor decisions I made in the next two days. I learned about her accident at the finish – another sleep deprived and impaired rider had plowed into her at speed, knocking her off her bike and landing her in a French emergency room. When we were re-united some hours later, I attempted to read what turned out to be incomplete medical records in a language I speak marginally to figure out what had happened to her. Whether there was mention of a head injury in the records which I didn’t understand, whether that was in the missing portion of the record, or whether it had gone completely undiagnosed because of other more urgent issues I will never know. I misinterpreted what I saw in my friend as fatigue, shock, hypoglycemia, and a worsening of her other medical conditions rather than recognizing the signs of what turned out to be a significant concussion. While I refused to leave her on the side of the road between Loudeac and Carhaix, I did leave her in a hotel room in Paris after my husband arrived. The results could have been as deadly, but thanks to another friend who was more competent and resourceful than I she was able to make it back home and get the treatment she needed. At the end of the ride, I felt fine. I had pedaled a bicycle 760 miles in over 88 hours with approximately four hours of sleep in nearly four days. The reality is that I was not fine. I happily slept in with my husband every morning of our time in Europe – getting 10 or more hours of sleep per night for most of the week. I am usually awake and ready to start the day 7.5 hours after going to bed, and typically I can’t stand to “waste” precious travel time on sleeping. I was on vacation so I didn’t need to handle complex cognitive tasks. The most strenuous things I needed to do were climb the legendary stairs to and from train platforms and lift a fork. I ate at least my body weight in pastries and confit on a daily basis, and indulged in Belgian beer with enthusiasm. It was not until I was working on writing this blog on the flight home that I realized that my brain was not fully recovered from the combination of exertion and sleep deprivation. This is the first time I’ve completed a 1200k ride, and the longest period I’ve ever gone without sleep. I’ve always taken at least two days off from work after a 600k ride because I’ve felt “stupid” for that amount of time. My first day back at work was 12 days after I finished this ride, and my ability to hold details in my head for an hour or two was still less than normal. 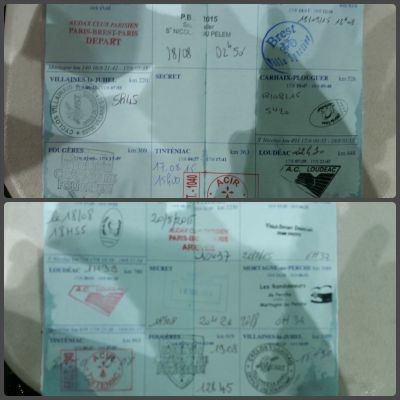 For the first week after the ride, every time I signed a credit card slip my handwriting was shaky. While this has improved, two weeks after the ride it is still not perfect. I did not recognize how much muscle soreness and fatigue I was experiencing until I saw my chiropractor the day after I returned to the States. My brain was not properly processing the signals from my body, and while this was a great adaptation which allowed me to finish the ride with far less discomfort than I expected, the length of time it has lingered is sobering. After an adjustment, a massage, and a good bit of time with my foam roller I am still experiencing numbness in all of my toes and chronic tension in my legs and hips. I rode 53 miles the weekend after I returned, and afterwards felt as if I’d ridden 200 miles. The recovery from this event has been challenging, and what I find most interesting is the lingering impact on my brain. There is a part of me which wants to do more rides of this length. To figure out how to fine tune the nutrition and the timing and the ride strategy to allow me to get more sleep and feel better at the end, see new places, meet other incredible randonneurs. There is also a part of me which thinks perhaps, like Icarus, I’m beginning to get too close to the sun. The combination of chronic conditions and a crash was very nearly fatal for my riding companion, and I was too impaired to recognize the severity of her situation. It could just as easily have been me who was hit by that other rider and landed in an emergency room in a foreign country with no ID. My friend believes she would have made different decisions under those circumstances. I know her intentions are pure, and while she has more experience with the degree of sleep deprivation which occurs on a 1200k ride than I do (having ridden nine of them), I also know the degree of impairment in judgement from lack of sleep cannot be over estimated. While we all believe we can rely on the assistance and judgement of our fellow riders in an emergency, I’ve now experienced first-hand that this may not be true at all. As of this writing, I haven’t decided whether I will ride another 1200k or what I will do differently if I do. In Chinese medicine, we have a concept of yin and yang. Yin is the cool, dark, feminine. Yang is the bright, active, hot, masculine. Neither can exist without the other, and there is always a bit of yang within yin and yin within yang. The great yang of the triumph of finishing my longest ride ever, the apex of three years of training, will always contain the yin knowledge that my impairment in judgement after the ride could have had the ultimate price for my friend. And perhaps this is just as it should be. A stark reminder that no matter how experienced, no matter how competent a rider, no matter ANYTHING, no one of us is immune from life’s risks, risks which are magnified in an event such as a 1200 kilometer bicycle ride. And the ride continues, even after the riders have gone home and the bikes are put away. Bigger than any of us, Paris Brest Paris will return in 2019. The only question which remains is: will I be a participant? 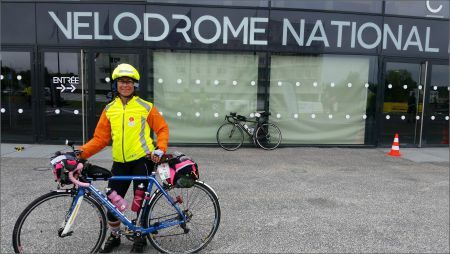 This entry was posted in Lisa's Bicycle Adventures and tagged Paris-Brest-Paris. Bookmark the permalink. I share your absolute frustration over the bathroom situation!! I don’t know all of what made a difference for me, but I have felt as though I have gotten better about managing the fatigue over the last couple of years of riding. Don’t get me wrong, I was still very addled at the finish, but I wasn’t in nearly as bad of shape as I was after my attempt in 2011 (Paris-Brest-Loudeac).